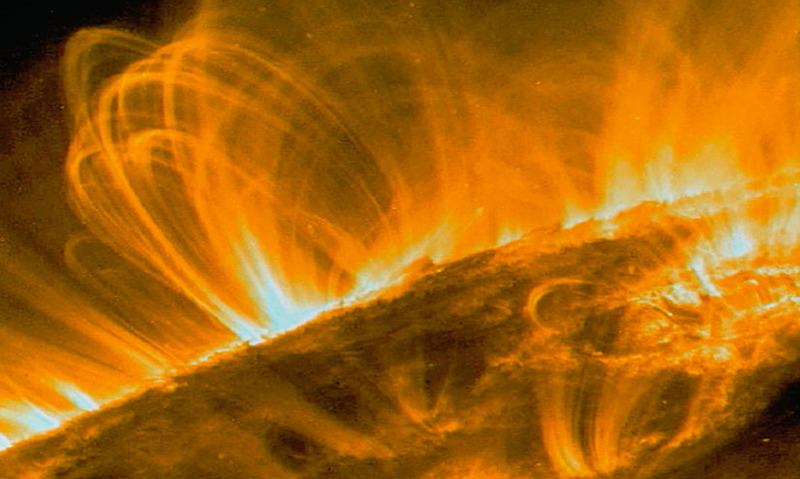 A violent explosion on the surface of the Sun which affects all the layers of its atmosphere, heating plasma to tens of millions of degrees and releasing huge amounts of energy. A violent explosion on the surface of the Sun which affects all the layers of its atmosphere, heating plasma to tens of millions of degrees and releasing huge amounts of energy. They take place on a time scale of a few minutes. Charged particles from these explosions cause spectacular aurorae when they reach the Earth's atmosphere a few days later. They take place on a time scale of a few minutes. Charged particles from these explosions cause spectacular aurorae when they reach the Earth's atmosphere a few days later.